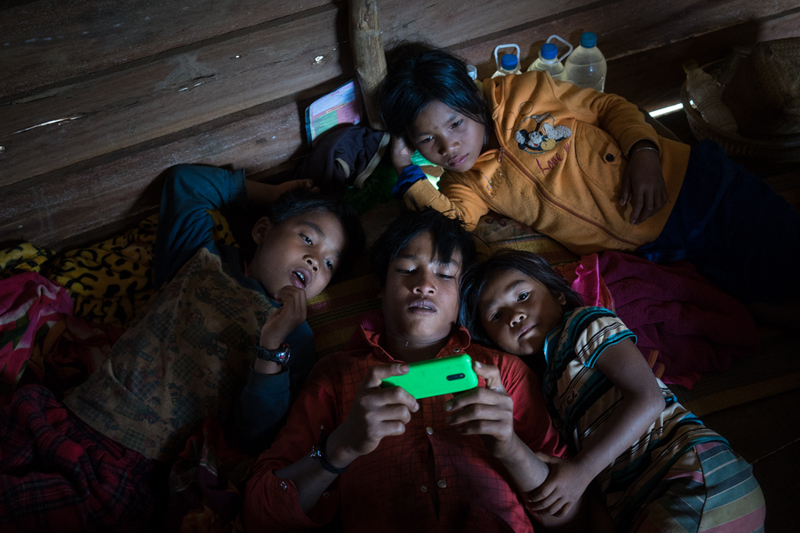 For young indigenous people, mobile technology plays a key role in dating, and keeping youth connected between villages. Many young couples meet by phone first, speaking for periods of time before meeting in person, to continue their courtship by phone. Channy goes back and forth to her hut in the dark, eagerly checking her smart phone on charge. Villages away, Ra sips on cheap rice liquor, playing with his friends phone. 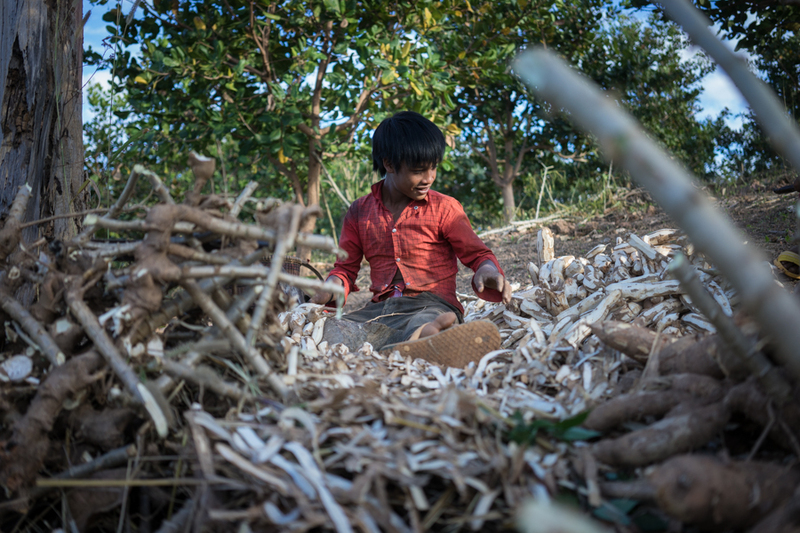 Channy and Ra met one month prior, as he briefly visited her village to plant cassava. A month later, and they speak almost every day on the phone. Young and thinking about the future, they are thinking about getting married. Coming from different indigenous Kreung, and Tampeun villages, it has become normal for different minorities to marry. Walking through both villages, there are no traditional bride and groom huts in sight. 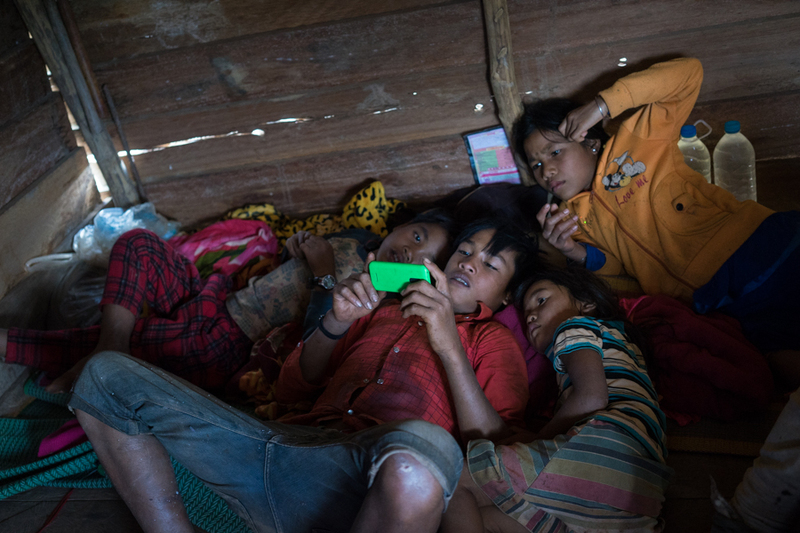 For young indigenous people, mobile technology plays a key role in dating, and keeping youth connected between villages. Many young couples meet by phone first, speaking for periods of time before meeting in person, or meeting briefly and continue their courtship by phone. Dating has become easier with the use of mobile technology, as well as time traveling to neighboring communities being cut significantly due to better road conditions and infrastructure within the province. These key changes mean its quicker and easier to communicate with potential love interests, and no need for young people to stay over night in personal huts, as they may have previously done before. Channy, 14, is an indigenous Kreung, living in Samross Kem village, in the sparse northeastern province of Ratanakiri. Like many young girls in the village, she is eager to find a boyfriend, and to get married. Young and in love, she misses Ra, as she only gets to see him once or twice per week, at the end of the day, after a long day of picking cassava, and collecting rubber. After she finishes working on the rubber plantation at sunset, she baths in the well, eats with her family, then heads into the village to watch television with her friends, and speak with Ra on the phone. She has had a phone for over one year, and it is important for her to keep in contact with people- Like Channy, most young people in the village have phones. She would like to get married, but would first like to find a job, so she can support her family. Now she wakes up every morning at 4am to collect rubber from the trees on the plantation where her family live and work. She says that marriage is important, as you can find someone to support your family. Ra, 16, an indigenous Tampeun, lives in Ping village- a few villages away from Channy. 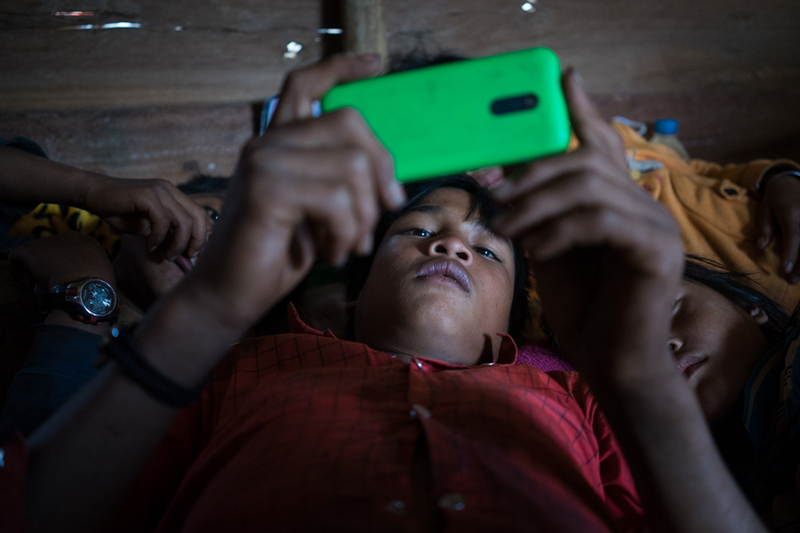 Unlike the other young people in the village, Ra does not own a phone as he cannot afford one. Instead, he constantly borrows the phones of other workers and villagers, throughout the day and night. 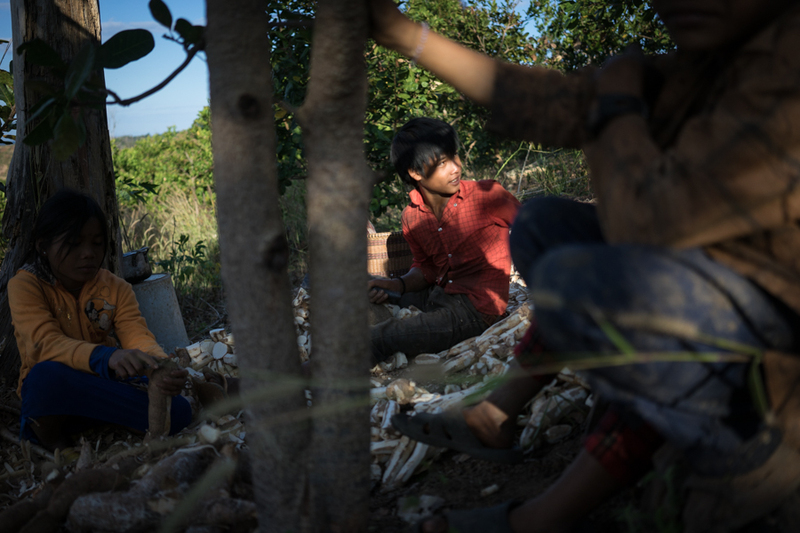 Like most young indigenous boys in the province, he enjoys drinking strong local liquor and other alcohol at night, traveling around different villages, visiting different girls. Ra met Channy when visiting her village to work, he says she was very pretty, and continued speaking with her by phone after he left. Despite speaking to three other girls in three different villages, he claims he loves Channy, though he does not want to get married soon. Having access to mobile technology, Ra does not have to see the women he is communicating with, and can keep in contact with them via phone.